Students use intermediate skills to calculate the area of rectangles. Multiply the base by the height to find the area for each problem. Multiple-step problems are included. Interactive features include "write your answer," and "touch the correct answer." 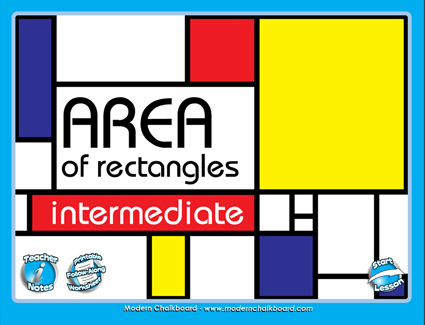 In this SMART Board Notebook lesson, students will calculate basic area of rectangles. 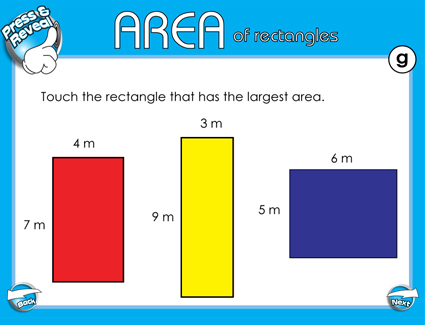 Multiply the base by the height to calculate the area of the various rectangles. Interactive features include "write your answer," and "circle the correct answer." Students learn how to determine basic area in this SMART Board Notebook lesson. 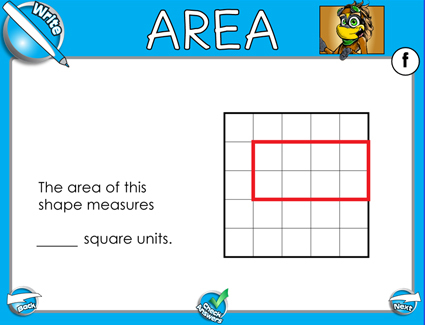 Students will determine the area of each shape in square units, based on how many squares are able to fit inside the shape. Students will also draw their own shape according to the length and width dimensions given. Answers will vary. This lesson is excellent for developing critical thinking skills. 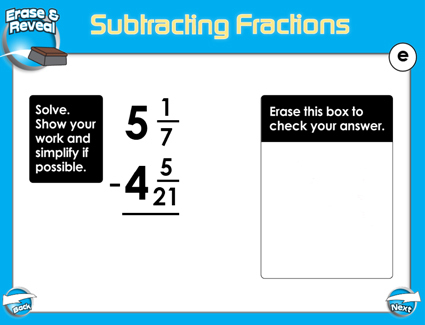 Subtract mixed numbers with different denominators. Most answers require simplification. Includes three word problems and an optional follow-along worksheet. Help your students build confidence in their dividing skills with this SMART Board Notebook lesson featuring 2-Digit by 1-Digit division. The students will need to decide which digit goes into which box to finish the problem and produce the correct answer. When they have done so, they can swipe the pull tab to check their answer. This lesson gives students practice in critical thinking and problem solving. Learning basic multiplication is fun with this SMART Board Notebook lesson featuring 1-Digit by 1-Digit multiplication problems. Your students will be asked to plug the digits into the problem in order to achieve the answer given on each slide. When they've finished the problem, they can check their answer by swiping the pull tab. This lesson teaches critical thinking skills and problem solving. 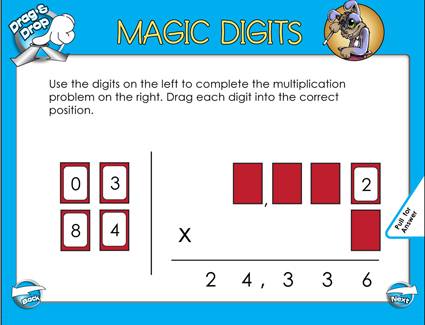 Encourage your students to develop critical thinking skills in this SMART Board Notebook lesson that teaches mulltiplying 4 digit by 1 digit numbers. 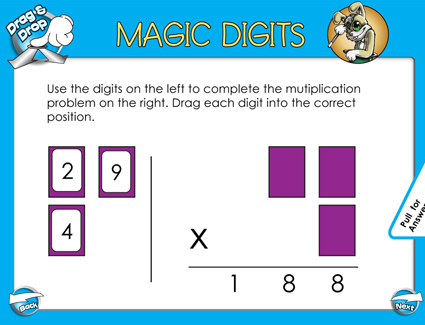 This exercise will get your students creative problem solving in gear as they arrange the digits to complete the multiplication problem. They can check their answers by swiping the pull tab. 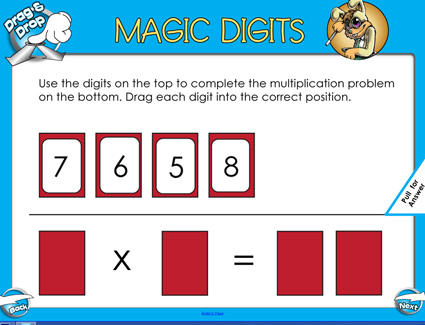 Add some magic to your multiplying 4 digits by 1 digit lesson with interactive magic digits! Boost your students' confidence in solving multiplication problems with this 3 digit by 1 digit SMART Board Notebook lesson. Students will use critical thinking and problem solving to figure out where to place the digits in each problem to produce the given answer. Then they can swipe the pull tab to check their answer. 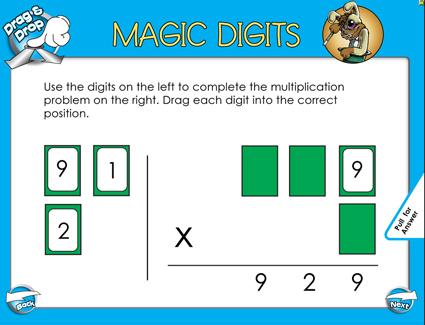 Even advanced multiplication is fun with this interactive magic digits game! Give your students the opportunity to practice multiplying 2 digit by 1 digit numbers in this fun SMART Board lesson. 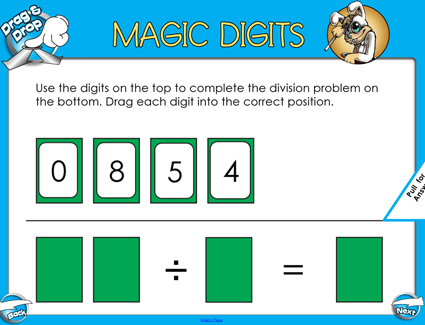 In this activity, students arrange the digits until they produce the given answer. Swipe the pull tab to check your answer. Use this lesson to promote critical thinking skills and problem solving with multiplication problems. 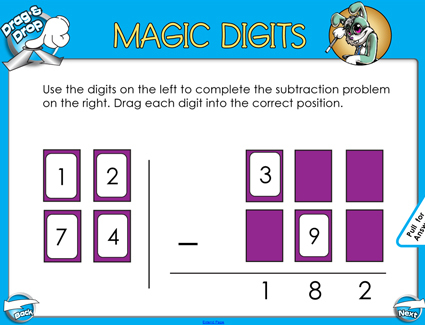 This SMART Board Notebook lesson teaches students to subtract with 3 digit numbers. This lesson includes regrouping. In the activity, students are instructed to fill in the blank boxes with the correct digit in order to produce the given answer. The goal of this lesson is to enhance students' critical thinking skills.